Many of these definitions are a synthesis of those given in the glossaries in Gleason and Cronquist (1991), Raven et al. (1986), Harrington and Durrell (1957), and Fernald (1950). Achene: A dry, one-seeded fruit that does not split open (indehiscent) and in which, unlike grasses, the seed is not fused with the seed coat. Typical of the families Asteraceae, Polygonaceae, Cyperaceae, Ranunculaceae, and a few genera of the Rosaceae (Fragaria, Potentilla, Geum). Achenes with wings (Samaras) are typical of the family Aceraceae, and the genus Fraxinus (ashes). Acid: Soil or water with a pH below 7. pH 7 is neutral. Aggressive: Plants that grow rapidly and are often colonial, producing many stems from one extensive root system. Rough goldenrod is an aggressive plant relative to butterfly weed. Alkaline: Soil or water above pH 7. Alkaloid: A large group of carbon compounds that include at least one nitrogen atom. These chemicals are produced by plants. They include a ring of carbon atoms with a nitrogen atom, there are about 6,500 known alkaloids which vary widely in structure. Many are very toxic. Some have important medicinal properties. Studies indicate that these chemicals protect plants from being eaten (Harborne 1988). Allelopathic: plants that produce substances, usually in roots or fallen leaves, which inhibit the germination or growth of other plants in the vicinity. Most of these chemicals are alkaloids, terpenoids or phenolics. See black walnut (Juglans nigra). Alternate. One leave at each node along a stem (see opposite). Annual: Herbs (or grasses) that complete their entire life cycle within one growing season. They overwinter only as seed. Winter annuals sprout in autumn and overwinter as leafy rosettes. Ragweed (Ambrosia artemisiifolia). Anther. Male reproductive organ of an angiosperm (flowering plant). Pollen bearing part of stamen, usually at the top of a slender stalk (filament). Pollen contains sperm. Aril. A fleshy coat partly or completely surrounding a seed inside the fruit wall (not part of the fruit itself). Most often found in fruit that has an inedible outer wall that splits open to reveal the aril covered seeds. Birds and other animals eat the fleshy coat and disperse the seed. Awn: A long, slender bristle, usually attached to the back or tip of a grass floret part (lemma). Axil. The angle between a leaf and stem, stem and branch or between two branches. A structure in an axil is axillary (see Terminal also). Barren: Habitats with dry, low nutrient, rocky or sandy soils. Barren habitats support specialized plant communities adapted to these inhospitable conditions. Plants adapted to barrens soils are often poor competitors on high nutrient soils with more aggressive species. Bearberry (Arctostaphylos uva-ursi). Biennial: Plants that complete their life cycle in two years. They usually grow as a rosette of leaves the first season. The following summer they produce a flowering stalk and die after seeds mature. Evening primrose (Oenothera biennis). Bilaterally symmetrical. (zygomorphic) A flower that can be dived into two mirror image halves through only one plane, i.e. one side is the mirror image of the other, like animals. Bog: Open, quiet, oxygen and nutrient poor wetlands that accumulate partially decayed plant remains (peat). Brackish: Water with between approximately 0.6 to 17 parts per thousand salt (ppt). Fresh water has 0-0.5 ppt salt. Ocean water averages 35 ppt salt. Basal. Leaves all grouped at the base of the plant. A radial arrangement of basal leaves is called a rosette. Berry. A fleshy fruit with seeds embedded in the pulp. Blade. The expanded portion of a leaf. Bract: Leaf-like appendage, most often associated with an inflorescence. Often much smaller than a leaf (Asteraceae) but sometimes about the same size and appearance (Cyperaceae). Bracteate: Covered by bracts, as the base of the flower heads of plants in the family Asteraceae. Bulb. Underground storage organ made up of thick leaf bases, layered. An onion is a bulb. C4 metabolism: A variation of photosynthesis in which the initial chemical reaction combines CO2 and water into sugar by adding them to a 3 carbon compound resulting in a four carbon compound. The basic, C3 pathway (Calvin cycle) adds CO2 and water to a 4 carbon compound resulting in two molecules of a 3 carbon compound. The C4 (Hatch-Slack) pathway is used by plants adapted to drought, heat and intense sunlight (see PEP carboxylase). It is much more efficient in its use of CO2 and water, but uses more energy than the C3 pathway alone. The initial products of C4 metabolism are subsequently fed into the normal C3 pathway, but in adjacent set of cells so the reactants and products do not interfere with one another. Calcareous: Soils high in calcium, derived from limestone (concrete is artificial limestone). These soils are generally circumneutral to alkaline (about pH 6.8-7.5). The term “rich” is often applied to calcareous soils because many nutrients (especially calcium, magnesium, phosphate and potassium) are more available in neutral or slightly alkaline soils than in acid soils. Calyx: Collective term for sepals. Non-reproductive flower parts, usually below the petals. Capsule: A dry, hollow fruit that usually splits open to release seeds. Colonial (clonal): Plants reproducing vegetatively by various methods: root sprouts, underground stems (rhizomes), runners, bulb offsets. They may form large stands that are essentially a single plant. All are genetically identical. Compound: Leaf with more than one blade (leaflet) connected along a common stalk (axis, rachis). Competition: The ability of one plant to shade out, or overwhelm another plant. Plants adapted to poor soils, and marginal habitats are often outcompeted in better habitats by more vigorous or taller plants. I.e. Gnaphalium obtusifolium (Sweet everlasting) can be outcompeted by Solidago canadensis (Canada goldenrod in good quality soil. Contractile roots: Roots that serve to pull a bulb, corm, rhizome or other storage organ further down into the soil. Contraction occurs as root cells change shape. Corm a short, thick underground storage organ, usually rounded, without layers (see bulb). Above ground parts arise from top, roots emerge from base, typical of plants with extensive dormant periods such as spring ephemerals, (trout lily, Erythronium). Corolla: Collective term for petals. Non-reproductive flower parts, usually just above the sepals (calyx). Deciduous. Falling off, not persistent, leaves, stipules, flower parts. Most of our woody plants have deciduous leaves that fall off in autumn, thus are forests are termed “deciduous hardwood”, rather than “evergreen coniferous” forests further to the north. Determinate growth: woody plants that put forth a single extension of stem and leaves in one season, even under favorable growing conditions. Herbaceous plants in which growth of stem and leaves is topped by development of flowers halting further vegetative growth. See indeterminate. Dioecious: Plants in which male and female flowers are on separate individual plants; flowers unisexual. Ilex (holly), Myrica (bayberry), Sassafras. Dispersal. Referring to seeds; the removal of seeds from parent plant to a new location by wind, water, birds or other animals. Many fruits are fleshy or have a fleshy coat around the seeds. This is attractive to animals that eat the flesh and pass seeds in feces. Birds often regurgitate large seeds. Dominant: The most abundant plants in a particular plant community. In this region swamp forests are often dominated by red maple. A co–dominant plant is about as equally abundant as the dominant species. Sweet gum-red maple swamp forests. Drupe: A fleshy, one-seeded fruit with a hard or stony layer around the seed. Prunus sp. (Peaches, cherries). Dune: Broad ridges of sand that parallel beach or other ocean fronts, slightly above high tide level. Highly disturbed by winds and storms, they are usually dominated by dune grass (Ammophila breviligulata). Back dune plant communities are those that develop behind shoreline sand dunes. They are often disturbed by storms and tend to be dominated by herbs and shrubs. Poison ivy, bayberry and beach plum. Emergent: Plants that grow in shallow water with their leaves above the water’s surface or in water logged (saturated) soil that is flooded periodically. Peltandra virginica (Arrow arum), Carex stricta (tussock sedge). Endophyte: Fungi (usually Ascomycetes, but also Basidiomycotina, Deuteromycotina and Oomycetes in woody plants) that infect the leaves and stems of healthy plants without causing disease. They have been shown to deter herbivory in some grasses, apparently by producing toxins. Endophytes of grasses are the most intensely studied group and are related to Clavicipitaceae (Ascomycetes, including the ergot fungi). While conferring better growth and protection against herbivores (especially insects), the fungi often render the plant sterile (Carroll 1988; Clay 1988). In other cases the endophyte infects seeds, which transmits the fungus to the next generation of plants (Clay 1990). Endophytes have also been found in trees, shrubs, and ferns as well as grasses. They appear to be very common in plants. There also appears to be no clear line between endophytes and pathogens. The interaction between plant and fungus may depend on physiological and ecological circumstances (Saikkonen et al. 1998). See mycorrhizal fungi. Entire: plant part that is untoothed, unlobed, usually in reference to margins of leaves, stipules, sepals, or petals. Epigynous: Flower parts (Calyx, corolla, stamens) appearing to grow from the top of the ovary. Ovary inferior. Exotic: a non-native plant. A plant transported to this region by humans intentionally as a crop, medicinal, or ornamental or, inadvertently, as a weed (see native). Family. A group of genera with similar characteristics and a common evolutionary origin. The genera in the family Asteraceae. Filicopsida: Ferns. See introduction to fern chapter. Freshwater: Water with salt content less than 0.5 parts per thousand (ppt). See brackish. Fleshy: Relatively soft, not dry or woody. Fleshy fruits are usually eaten by birds or other animals that disperse the seeds by discarding, regurgitating or defecating them. Flower: collective term for the reproductive organs of an Angiosperm. This consists of the female ovary, a protective structure containing ovules that develop into seeds. The ovary is the defining structure of an angiosperm. The tip of the ovary is modified into a stigma that captures pollen grains Collectively the female parts of a flower are the pistil.The male flower parts consist of the anther, which produces pollen (which contains sperm) and the filament, the stalk on which the anther sits. Collectively they are a stamen. Free: Petals (or sepals) not attached to one another, not fused or tubular. Fruit: the ovary and associated tissues bearing seeds of flowering plants (Angiosperms). Fruit may consist of a single seed surrounded by the dried ovary wall, like seeds of grasses, or they may be hollow and contain several seeds or fleshy with the ovary wall and associated tissues, such as the hypanthium or receptacle thickened. Fleshy fruit is usually adapted to be eaten by animals that then disperse the seeds away from the parent. In some cases a dry fruit may contain seed(s) with a fleshy coat or attachment (aril). Larger arils may be attractive to animals but some small seeds of low-growing plants with arils are dispersed by ants. There are a great many terms for the forms that fruit may take. An effort has been made here to keep them to a minimum. Fused Petals or sepals attached to one another, forming a single, usually tubular, structure. Genus. A closely related group of species in one plant family. The genus name is a proper noun and is always capitalized, i.e. Carex. It is usually written in italics or underlined. Glume: the two outermost scales of a grass floret (spikelet). Some species only have one glume. See Family Poaceae. Graminoid: Grasses and grass-like plants. Usually including the grass (Poaceae), sedge (Cyperaceae) and rush (Juncaceae) families with very narrow, linear leaves and small, dry, wind-pollinated flowers, and dry, 1-seeded fruit. Gymnosperms: Seed plants that do not produce flowers or true fruit. The seeds are “naked,” not enclosed in an ovary. All of our are conifers, plants producing seeds on the scales of woody or fleshy cones. Head: flowers each with little or no stalk, in a densely crowded cluster, on a very short axis. Applied to flowers of Asteraceae in particular. Hemiparasite: A parasite that is not entirely dependent on finding a host plant and develops from seed in soil. Opportunistically derives part of its nutrition from a host but is green and carries out photosynthesis. A root hemiparasite taps into the roots of the host plant rather than above ground parts. Agalinis purpurea (smooth Agalinis). Herb: Plants without woody tissues, that die back to the ground in winter. Usually applied to broad-leaved plants rather than grasses. Hypogynous: Flower parts appearing to grow from beneath or at the base of the ovary. Ovary superior. Hypanthium: cup or ring-like structure surrounding the ovary that is formed by the margin of the expanded receptacle (top of the flower stalk) or by the fusion of the calyx or corolla base. Present in members of the Rosaceae among others. Indehiscent: persistently enclosed. Without a seam or suture that breaks open. Most often applied to dry fruit such as achenes. Inflorescence. 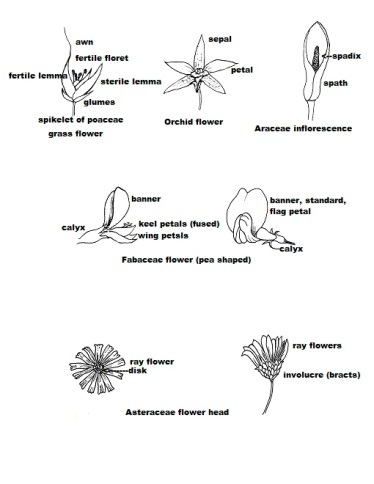 The flowering parts of a plant, including stems, stalks, and bracts, if any. Indeterminate growth: woody plants that continue to extend stems and put forth leaves as long as growing conditions are favorable. Acer saccharinum (silver maple). Indeterminate inflorescence: applied to herbaceous plants in which the inflorescence blooms from the base upward and continues to extend upward and produce flowers as long as conditions are favorable. Inflorescence: The part of a plant bearing flowers. Applied to plants with more than one flower. Internode: the part of the stem between attachment points of leaves or branches (nodes). Invasive: A plant species that grows and reproduces without constraint, crowding or shading out other plants. Applied mostly to plants not native to the given region. Invasiveness in a plant that is native to the region is rare and probably caused by unusual circumstances such as high nutrient input (especially in water bodies), removal of forest canopy (see Smilax rotundifolia), or loss of predators (as with many exotics), favoring uncontrolled growth. Invasive species decrease biodiversity of a plant community. Keel: a longitudinal ridge, usually an enlarged midrib down the back of a leaf sheath, bract, or scale. Leaflet. A division of a compound leaf with a narrow attachment to a common leaf axis (rachis), often with a small stalk (typical of many ferns). Lenticels. Small corky dots or lines in the surface of stems or other plant parts that allow for exchange of oxygen and carbon dioxide through the bark. Lemma: the scale-like flower bract of an individual grass floret that partly surrounds the stigma and stamen (see family Poaceae). Ligule: “little tongue” refers in grasses to the collar-like appendage on the inner side of the juncture between the leaf blade and sheath. Most often membrane-like or a band of hairs. In Asteraceae the term refers to the single long petal of a ray flower. Lip: A deep division at the top of tubular, bilaterally symmetrical flowers. Lobed. A leaf that is divided but not compound. The free part of a flower with fused petals (a tubular flower) or sepals. Marsh: Open, more-or-less permanently flooded wetland, dominated by emergent, herbaceous vegetation. Water may be fresh, brackish or salt. The latter two conditions are salt marshes. Metric measurements: meter (m), 100 cm, roughly 3 ft. (40 in. ); centimeter (cm), about 3/8 in., 1 in. = 2.5 cm. Midrib. Central, major vein in a leaf. Monoecious flowers unisexual but both male and female flowers on the same plant. Quercus, Carya, Pinus. Mycorrhizas: Symbiotic association between the roots of a plant and a fungus. The fungus helps extract nutrients, especially phosphorus, from soil and, in turn, uses carbohydrates manufactured by the plant. There are several different structural types of mycorrhizas. Ectomycorrhizae, are found mostly in trees, especially oaks (Quercus), and pines (Pinus) but also hickories (Carya) and other species. These mycorrhizas form a sheath-like structure around small roots and are formed mostly by Basidiomycetes, (especially the family Russulaceae), along with some Ascomycetes and a few Zygomycetes. Vesicular-arbuscular (VA) mycorrhizas are the most common type of root symbiosis. They occur in woody and herbaceous plants from ferns to trees and grasses. They are formed mostly by the fungal order Glomales in the class Zygomycetes. These fungi form structures within root cells called arbuscules and vesicles. Ericoid mycorrhizas: Mycorrhizas associated with Ericaceae (Heath family; Gaylussacia, Rhododendron, Vaccinium, etc.). In low nutrient, “heath” soils roots are apparently associated with ascomycete fungi that produce enzymes which help extract nutrients from partly decayed organic materials. This enzyme functions best at pH 2-5. Plants in the families Pyrolaceae (Pyrola and Chimaphila) and Monotropaceae (Monotropa uniflora) form specialized mycorrhizal associations mostly with Basidiomycetes. These appear to be similar to ectomycorrhizae. (Smith and Read 1997). Orchid mycorrhizas: In nature, orchids are obligately associated with certain fungi and seeds cannot germinate or grow in the absence of this association. Many of these fungi are pathogens of other plants, including the genus Rhizoctonia (Deuteromycotina), (Smith and Read 1997; Agrios 1988). Native plant: Plants that were growing in this region before Europeans came to North America. New York native plants are adapted to the climate and soils of the New York City region. They have relationships with birds, mammals, insects, and fungi and are integrated into the ecology of this region. The City’s native plants come from seed that spread northward after the last glaciers melted thousands of years ago. Node: Attachment points of leaves or branches on a stem. The internal anatomy at nodes differs from that of internodes due to the need for vascular tissues (xylem and phloem) to bend out into the leaf or branch. Nut: A (usually) 1-seeded fruit with a thick, hard wall that does not split open to release the seed (indehiscent). Nutlet: A small nut or hard achene. Often produced in groups of four (Lamiaceae, Boraginaceae). Offset. An informal term for small bulbs (corms, etc.) that form at the base of a larger bulb; often creating a dense colony of plants. Also applied to small plants growing from the tips of shoots of a larger plant. Opposite. Two leaves growing opposite one another at one node. Ornamental: Plants used as horticultural specimens in gardens or developed parks, not intended to reproduce or be part of a natural plant community. Very often they are non-native plants (lilacs, daffodils). Ovary: the defining part of the female reproductive system in angiosperms (flowering plants). The ovary contains one or more ovules, which develop into seeds. The ovary is generally located either above the insertion of petals and sepals (superior ovary, hypogynous), or below the petals and sepals (inferior ovary, epigynous), these sometimes persist as remnants at the base or tip of the fruit. In other plants the petals and sepals arise from structures surrounding the ovary, or between the base and summit of the ovary (perigynous). The ovary wall, and often, other tissues, develop into the fruit (Fernald 1950; Harrington and Durrell 1957; Raven et al 1986; Gleason and Cronquist 1991). 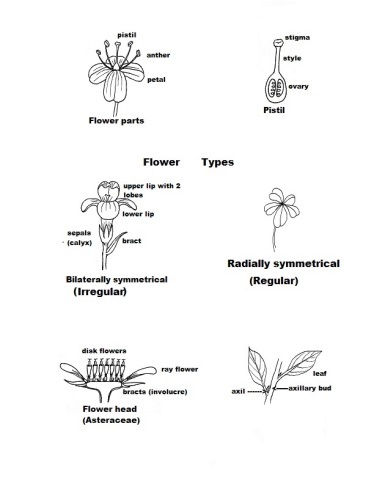 Refer to any botany textbook for a complete discussion of flower anatomy and function. Palmate. 1) Leaves with more than three parts, leaflets, arising from one point as fingers of a hand. 2) Leaf veins arising from the base of the leaf blade in a fan-shaped arrangement. Veins may be palmate only at the base of the blade, becoming pinnate along the upper part of the midrib, or less commonly, all the major veins may arise at the base of the blade (Acer). Parasite. Plants that take part or all of their nutrients from other plants. Some do no photosynthesis and are not green (lack chlorophyll). Others have some green tissue and partially support themselves with some photosynthesis. They may tap into the roots of other plants (root parasites) or the photosynthetic tissues. PEP carboxylase: The enzyme that catalyses the addition (fixation) of carbon dioxide to a pre-existing 3-carbon compound, oxaloacetate. This is the primary step in C4 photosynthetic pathway (Raven et al. 1986). However, it may take place using non-photosynthetic energy sources (Gilliam and Roberts 2003). See also Monotropa uniflora. Petal. A non-reproductive flower part, often leaf-like, white or colored, a modified leaf usually positioned in a whorl between sepals and stamens. Perennial: A plant that can bloom and fruit more than once. This includes all woody plants. Some perennials are short-lived, others may live for 200 years (oaks). See Annual and Biennial. Perigynium: The sack that encloses the ovary and achene (1-seeded fruit) in female flowers of Carex (Cyperaceae), sedges. pH: A measure of the acidity and alkalinity of soil or water. The lower the pH, the higher the acidity. Many native plants require acid soil with pH 4.5-6. Soils with pH above 6.5 are considered neutral and soils with pH above 7.5 are alkaline. (pH stands for the “Power of hydrogen” and is the negative log of the concentration of hydrogen ions in a solution). Phenolic: A class of plant secondary compounds with a structure that include a benzene ring (6 carbons 3 double bonds) with an OH (hydroxyl) group attached. This is a very large category of chemicals that includes hundreds or thousands of compounds. Among them are the red and blue colors of flowers and fruit. Pinnate: 1) Compound leaf with leaflets along opposite sides of the midrib (leaf axis, rachis), same form as a feather. When the bases of leaflets are connected to one another and do not reach the main leaf axis, they are considered lobes rather than leaflets, the leaf is then pinnately divided, rather than pinnately compound. 2) Secondary veins in a leaf that arise along opposite sides of the midrib, like the vanes of a feather. Pistil: Collective term for the female reproductive structures in an angiosperm (flowering plant), ovary, containing ovules that develop into seeds (usually after they fuse with sperm in pollen). The ovary wall usually becomes part of the fruit; style, a stalk above the ovary bearing the stigma, on which pollen, is received. Prickle: A sharp, pointed outgrowth from the bark of a plant (see spine and thorn). Pteridophyta: Ferns and fern allies, including ferns (Filicopsida: all fern families), horsetails (Equisetaceae) and club mosses (Lycopodiaceae) are vascular, non-flowering plants that do not produce seed. All of these seedless, vascular plants have a life cycle separated into two distinct stages. See introduction to fern chapter. Raceme: An elongate, unbranched flower cluster in which each flower has an individual stalk (see spike). Radially symmetrical. Star-shaped, in a general sense. A flower that can be divided into two mirror-image halves through any longitudinal plane (regular, actinomorphic). (See bilaterally symmetrical). Receptacle: the top of the flower stalk that bears the flower parts. Often broadened as in Asteraceae. Sometimes becoming part of the fruit as in Rosaceae. The upper margin of the receptacle is sometimes expanded to form a ring or cup called the Hypanthium. This may also be formed by union of the bases of flower parts (calyx, corolla). Rhizome: A creeping, usually horizontal, underground stem. Most often, bearing both roots and scale-like leaves and giving rise to new above ground shoots. Typical of many colonial plants such as Solidago canadensis. Rosette: A dense cluster of leaves arranged more or less in a circle (whorled or tightly spiraled) at the base of a plant (basal rosette), usually rather flat (Lobelia inflata, Indian-tobacco). Many biennials produce a rosette during their first year. These leaves often die as the flowering stalk grows during the second year, (Oenothera biennis, evening primrose). Some perennials produce a winter rosette in autumn that is green all winter and dies when the plant grows flowering stems the following spring (Geum canadense, white avens). Salt marsh: Open wetlands along the coast that are flooded during high tide. The combination of brackish to saline water and saturated soil severely restricts the plant species that can live in salt marsh habitats. High salt marsh: mean high high water (spring tides) to mean high water. The soil (peat) surface is flooded during high high water, soil is usually saturated below the surface during high tides. Low salt marsh: mean high water to mid (mean) tide. Surface usually saturated during most high tides, soil drains and becomes aerated as the tide recedes (Spartina alterniflora). Plants adapted to tidal wetlands, whether freshwater, brackish or saline, tolerate periodic soil saturation but are not adapted to continuous anaerobic conditions such as those experienced by emergent wetland plants. In order to survive, these plants need soil that drains and becomes aerated periodically during the daily tide cycles. On the east coast we have two tidal cycles each day. The hours of high tide shift forward by about one hour each day creating a continuously migrating set of two high and two low tides within each twenty-four hour period. Some emergent and aquatic plants also live in tidal wetlands. Saturated: Soil in which all the spaces between soil particles are filled with water. Saturated soil has very little oxygen, which is needed to support the life of plant roots. Scorpioid: Coiled from the tip, like the tail of a scorpion and usually one sided. Generally referring to an inflorescence. The term “circinate” also means coiled from the tip but more tightly, resembling the head of a violin, as in fern “fiddlehead”. Scrub: A plant community dominated by shrubs and other low woody and herbaceous vegetation. In northeastern North America, scrub is usually a stage in succession to forest, unless subject to frequent disturbance such as coastal storms which kill back dune scrub by blow outs or inundation from salt spray. Seed. Multicellular reproductive structure of higher plants (conifers and flowering plants). Contains an embryo that grows into a new plant. This is usually surrounded by storage tissue, often in the form of “seed leaves” like the two halves of a bean or the grain of a corn seed. The outer layer of the seed is the seed coat, which protects the seed. Secondary veins. smaller veins arising from the midrib or major veins of a leaf. Sepal. A non-reproductive flower part directly below the petals, usually leaf-like and green, sometimes petal-like, collectively sepals form the calyx. Sheath: one plant part that surrounds another. Usually referring to the lower part of a grass leaf that enfolds the stem below the blade. Leaf sheath may have its margins open and overlapping or fused (closed) up to almost the top (see family Poaceae). Mostly typical of monocotyledons, such as Araceae, Cyperaceae, and Juncaceae. Apiaceae is one of the few dicotyledon plant families that have leaf stems with sheathing bases. Simple. Leaves with a single blade, not compound. Simple leaves may be toothed, lobed or divided but the divisions are always connected to one another by tissue along the leaf midrib (axis, rachis). Spike: An elongate, unbranched flower cluster in which the flowers are stalkless (sessile) on the inflorescence stem. The term “spike-like” here generally refers to a raceme, in which each flower has a stalk. Spikelet: “small spike” referring to flowers of grasses and sedges, a cluster of one to many individual flowers along a very short axis, above 1-2 scale-like bracts (see family Poaceae). Spine: A sharp, pointed projection that is a modified leaf (see prickle and thorn). Spore. Single celled, microscopic, reproductive structure produced by ferns and other plants that do not produce flowers, fruit or seeds (pteridophytes: ferns, horse-tails and club mosses). Spore case. Sori (sorus). Clusters of sporangia, the structures containing spores in non-seed bearing plants. Sori are usually covered by a thin protective structure called an indusium. A hand lens is necessary to see these details. Spring ephemeral: forest herbs that grow, bloom and set fruit before leaf canopy closes. They are not shade tolerant but squeeze their life cycle into the time between freezing weather and deep shade of the forest floor. Most go dormant and disappear by July (Erythronium americanum, trout lily, and Claytonia virginiana, spring beauty). Stamen. Male flower part, usually composed of a thin filament (stalk) holding up a thicker, pollen bearing anther. Pollen contains sperm. Stigma. Female flower part that receives pollen. Located above the ovary and connected to it by the stem-like style. Stipule. A small, often leaf-like appendage on the stem at the base of the leaf-stalk, often paired, (Rosa) sometimes forming a tube around the stem as in Polygonaceae. Sometimes joined across the stem of plants with opposite leaves (Diodia teres). In some cases the stipule serves to cover the leaf bud and falls off as the leaf expands (deciduous), often leaving a scar around the plant stem (Magnolia). Stolon: a creeping, horizontal stem at ground level, often rooting and developing new plantlets creating a colony of genetically identical plants (Fragaria, strawberry). Submerged (submersed): Plants that grow with their leaves underwater. Submerged Aquatic Vegetation, (SAV). Potamogeton sp., pondweeds. Succession: The sequential change in vegetation over time, from open soil to forest, after a disturbance such as farming, fire, wind throw or logging (see Introduction). Swamp: Occasionally flooded wetlands, dominated by woody vegetation. Shrub swamp or swamp forest. Tendril. A slender outgrowth of a stem or leaf, usually coiled, that serves as an organ of support. Tepal: undifferentiated petals and sepals as in Juncaceae or Lilies. Terminal. At the end of a stem or branch. Usually referring to an inflorescence (see axillary). Terpenoid: chemical compounds derived from specific hydrogen-carbon precursors called isoprene units. important compounds include rubber, orange and yellow carotenoid pigments, plant growth hormones and hundreds of others. Thorn: Stiff, sharply pointed projection that is a modified stem. Branches of Crataegus sp. (see prickle and spine). Toothed: A leaf or petal with a jagged or serrated margin. Tuber: An enlarged, fleshy root, thickened part of an underground stem (rhizome), a storage organ. Also a source of vegetative reproduction (potato). Understory: Habitat under the tree canopy of a forest. The plant community of tree saplings, shrubs, herbs, graminoids and mosses that can live in shade or part shade. Unisexual: Flowers expressing only male or female function. Often anatomically male (with stamens) or female (with ovary and stigma and fruit production). Sometimes unisexual in function only. Vein: A strand of tissue with a central cavity that carries water and nutrients and provides support. Collectively they constitute the vascular system of the plant (xylem and phloem). Venation: Pattern of veins in a leaf. Wetland: An area that is “inundated or saturated by surface water or ground water at a frequency and duration sufficient to support vegetation typically adapted for life in saturated soil. Wetlands generally include swamps, marshes, bogs and similar areas.” The defining characteristic of wetland plants is that they can tolerate soil that has little oxygen because the air spaces are filled with water (saturated). Whorled: Three or more leaves, or other structures, in a circle at the same level (node) on the stem. Winged: a thin expanse of tissue bordering or surrounding another, thicker, structure, usually applied to seeds, or the midribs of compound leaves. A winged leaf stalk, in which narrow margins of leaf.